This popped when working with the bgl module. There is a good shader based alternative however with an example in the docs. You assign an object to bpy.context.view_layer.objects.active. In many circumstances the view_layer is now the ultimate arbiter of what we see. This allows for organizing the visibility of objects in a scene but it also offers the link to the active object. Which makes sense because it is part of the VIEW3D area. Too bad, but I guess this wasn used very often anf the new quality settings of the modifier might well server the purpose even better. So you cannot decide where your Panel will be located in the Toolbar. For quite some time it has been possible to create draw handlers in Blender that use OpenGL functionality to draw overlays in the 2d view. Until now this functionality has been restricted due to older bindings, limiting the exposed OpenGL functionlity to version 2.0 features. The most noticeable effect of this is slow performance in complex drawings due to the lack of vertex buffer objects. With Blender 2.80 however all new bindings have been added that expose OpenGL version 3.3 and the Python API has been expanded to not just to expose those bindings but add some convenient extras as well that greatly help you to get started. I haven't uploaded any code yet but I do want to illustrate the important bits with some code snippets. The numpy part is actually not relevant to our current discussion but it speeds up working with lots of geometry quite a bit. More in the gpu module can be found in Blender's online documentation. Because we want to draw transparent faces, we enable blending (line 1). We will need a shader to draw our geometry but because the faces will be a uniform color we can use a built-in shader (line 2). It is necessary to bind the shader (line 3) to assign a value to its uniform color later. Next we calculate the vertices and indices that make up our geometry (line 5). The positions of the vertices are in uniform coordinates (i.e. 4 components, x,y,z,w with w == 1.0) so the world matrix of the object around which we are drawing can be used transform those coordinates to world space. Because the positions we will pass to our shader need to have 3 coordinates we remove the 4th coordinate after the transformation (line 8). Next we create a batch, i.e. all necessary information to actually draw our geometry. We tell what shader to use, and that we will be drawing a collection of triangles (TRIS) and we pass it a list of indices (in this case 3 for each triangle) to point to the vertices that make up those triangles (line 10). Finally we assign a color and do the actual drawing (line 12). Note that we didn't do anything with regard to positioning the camera or calculating a view matrix, this is all setup in Blender's draw handler already so anything we draw in the 3d-view will react to camera changes without us having to do anything. Although in principle OpenGL coudl be used to determine where a mouse click lands on a bit of drawn geometry, implementing it that way would be rather cumbersome. It is easier by far to use other Blender built-in functionality for that. A BVH tree is a structure that can be used very efficiently to determine whether a ray intersects any of the triangles in the tree, even if we have thousands of them. Note that the first argument to the FromPolugons constructor (line 8) is a Python list of vertices with 3 coordinates, that is why we again drop any 4th coordinate when we calculate the world coordinates (line 5) and convert our numpy array explicitly to a Python list. Every triangle is defined by 3 indices into this list of coordinates so we convert the linear list of indices to a Nx3 array. The Blender implementation can work with other polygons besides triangles but it is more efficient if it knows all polygons are indeed triangles so that is what we indicate when we create the tree. To get the origin and direction of the ray that is coming from the 3d view viewpoint into the scene to the point where you click the mouse, the view3d_utils module provides us with all the necessary components to calculate those if we provide the mosue coordinates and the region data (line 10+11). We can then use the ray_cast() method of our BVH tree to see if the ray intersects any triangle. Note that the origin and ray are in world coordinates and that is the reason we constructed our BVH tree in world coordinates in the first place. It is quite simple to draw OpenGL overlays in the 3d view and interact with it based on mouse clicks. The new Blender 2.80 Python API for OpenGL provides us with all we need and drawing can be done very efficiently. There is of course a lot more to OpenGL and a good place to start might be to look at the examples provided in the gpu module documentation. 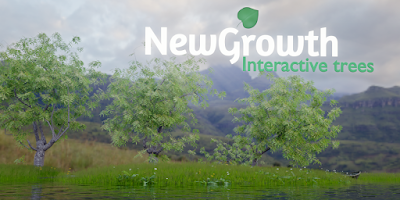 In a previous post I introduced NewGrowth, a new add-on to draw trees interactively. In this video a more detailed overview is presented of the features that are available in NewGrowth. 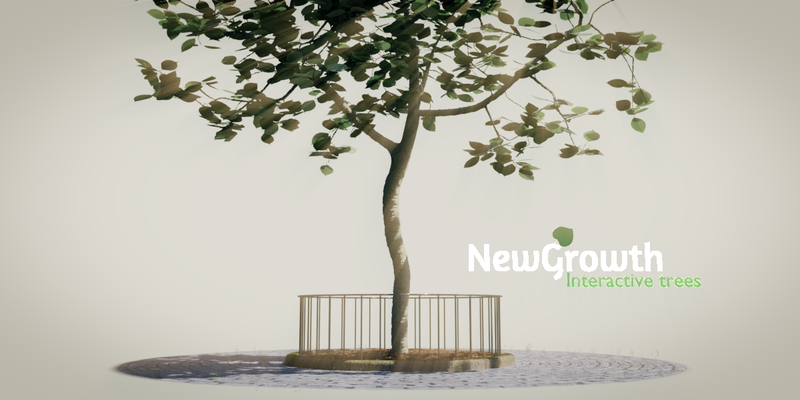 NewGrowth is available in my BlenderMarket store. Finally, after more than five months of work I am pleased to present NewGrowth, my new interactive tree drawing add-on for Blender. 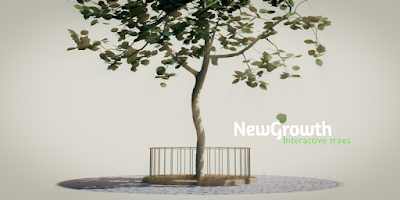 NewGrowth is available from my BlenderMarket shop. 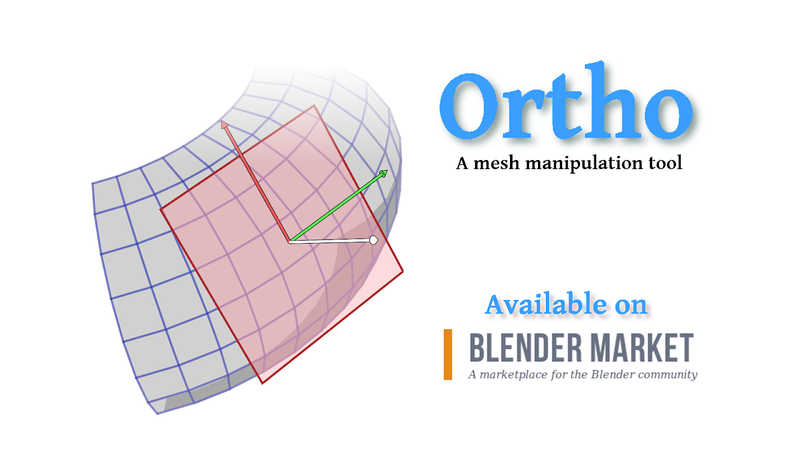 The fourth add-on in my portfolio to be ported to Blender 2.80 is Ortho.